It's almost Cinco de Mayo, which means it's almost time for margaritas, which means.....it's almost time for a FIESTA!!! I couldn't possibly think of a better celebration for bringing Dress & Dine out of hibernation, so here we are dressing & dining our way through a grand ol' fiesta! Ole! When I think of Cinco de Mayo and fiestas, I think color. Due to my move to more neutral territory, colorful outfits aren't exactly calling my name. Instead, I stuck with my favorite denim-on-denim combo, making it fiesta-appropriate with a bright scarf and some fun earrings (both of which won't put too much strain on my neutral vibes). I've selected a bevy of bright scarves and accessories (below) should you feel like jazzing up your own Cinco de Mayo outfit. I'm as big a fan of guac, queso and tacos as the next person, but I thought it would be fun to switch things up and make some bite-sized empanadas. 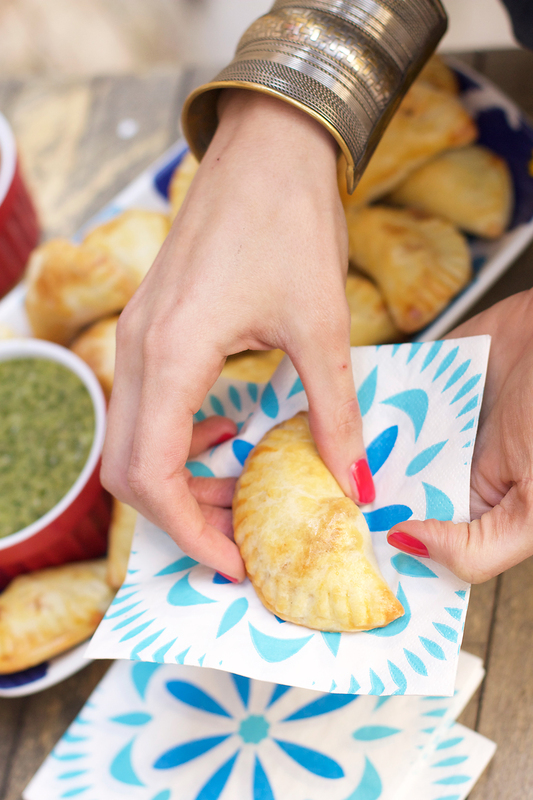 Serve them with chimichurri sauce (recipe here) and I promise you, no one will be complaining! Dessert was a no-brainer, with churros and salted caramel sauce. Sticking with the unintentional theme of bite-sized things, I, of course, couldn't resist making the churros small. I followed this recipe for the churros and this recipe is my favorite for homemade caramel sauce. 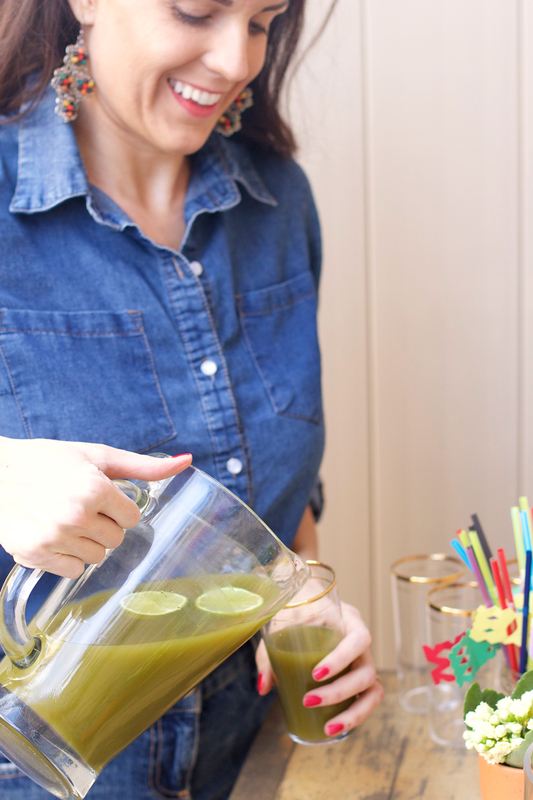 For drinks, I whipped up a pitcher of tropical matcha tea margaritas. I recently professed my hatred for all things matcha tea, until I was reminded of a Trader Joe's purchase from last year that I was pretty obsessed with. Their tropical fruit green matcha tea mix is pretty ridiculously good on its own, but it tastes even better with a little tequila added in. If you're looking for more fun margarita options, check out this post (the sorbet-rita ones are a fave of mine). Papal Picado Banner Straws: Cut out small squares of construction paper (about 2"x 2"). Then use your scissors to make freehand cut-outs (along the edges, or fold the paper in half or in thirds before cutting to make cut-outs in the center; I used this as inspiration). Using a small piece of invisible tape, adhere each banner to a straw. For more ideas be sure to check here.